Ever wonder where you can meet the happiest, healthiest people in America? Turns out there鈥檚 actually a way to find out without traveling to every single state yourself: The polling firm Gallup recently released its annual 鈥淲ell-Being Index,鈥� a survey of around 115,000 people, which determined where the most contented people in the country reside. 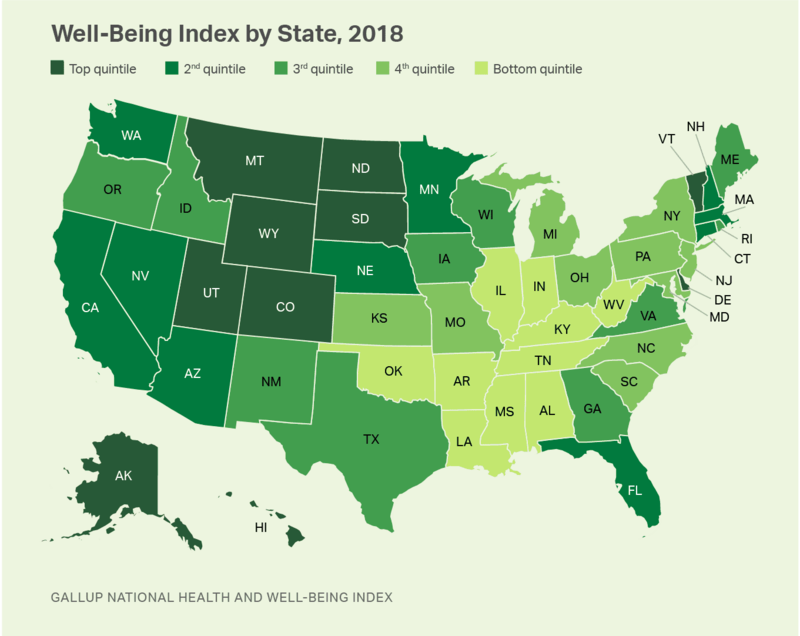 The survey, which Gallup has conducted since 2008, calculates a state鈥檚 overall well-being based on a set of five criteria: physical (overall health), social (supportive relationships), careers (job enjoyment), financial (economic security), and community (pride in the place you live). You might not be incredibly surprised to learn that Hawaii scored the highest in each category. With a breathtaking natural landscape that offers endless opportunities for outdoor adventures from surfing to hiking to swimming, it鈥檚 no wonder that people who live in Hawaii are immensely proud of their state, and prioritize their physical, as well as mental, well-being. I certainly would feel grateful if I woke up every morning with a view of the ocean on one side and mountains on the other. The rest of top ten highest-scoring states are Wyoming, Alaska, Montana, Utah, Colorado, Vermont, Delaware, South Dakota, and North Dakota. Probably not by coincidence, almost all of these states are home to natural wonders like the Grand Tetons and Glacier National Park where people can explore, adventure, and stay in shape. And as scientific research has shown, exercise can lead directly to increased happiness. Colorado and Hawaii also have the lowest obesity rates in the country, and have ranked in the top ten happiest states every year since the survey鈥檚 inception. States that scored the lowest include Indiana, Louisiana, and Illinois, partially because they have among the highest obesity rates in the country. Residents also reported low scores in the financial security and job satisfaction categories. Still, that doesn鈥檛 mean everyone in any of those states is miserable. No matter where you live, there are ways to stay active, and find joy in even life鈥檚 smallest, simplest moments.